Vanishing puzzles have been around for over five centuries, but they weren't so popular until one man came around and change that completely. His name was Sam Loyd (1841-1911) and he created one of the most recognizable Vanishing puzzles ever, called Get Off the Earth, which was invented in 1896. He also created other interesting designs, and since then other designers followed in his footsteps. One of this designers is Jean Claude Constantin and the puzzle is called Magic Domino. The principle behind the vanishing puzzles is quite simple and deceiving. Each puzzle is divided into smaller pieces that compose a picture. When you rearrange the pieces in a specific order it's possible to make some objects in the original configuration disappear. This trick seems like pure magic, but it's far from that. It's merely a well designed puzzle with every little detail carefully thought out to play with your mind. The Magic Domino is exactly like the above description. 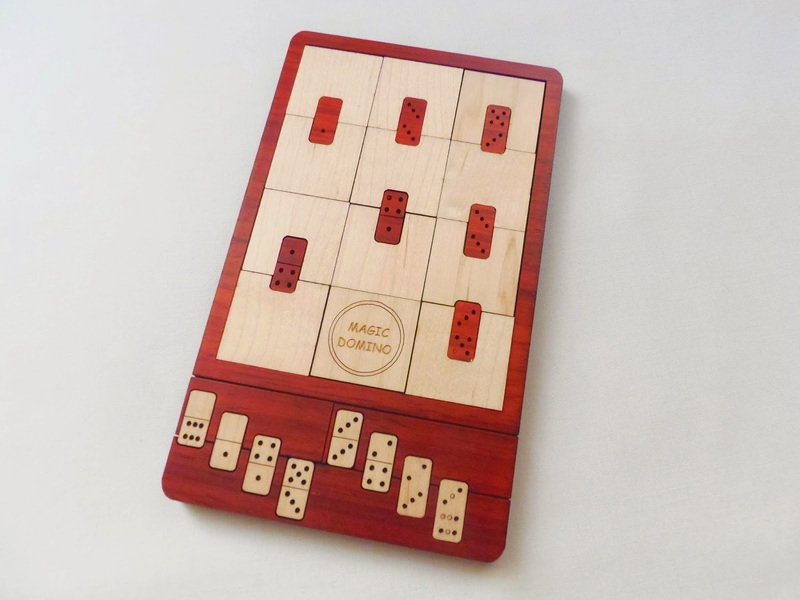 There are two sets of domino pieces, one with eight white pieces and another with seven dark brown pieces. The goal is a little more complex than the vanishing puzzles, but still similar. The idea is to swap the brown domino pieces in the tray with the bottom white pieces. 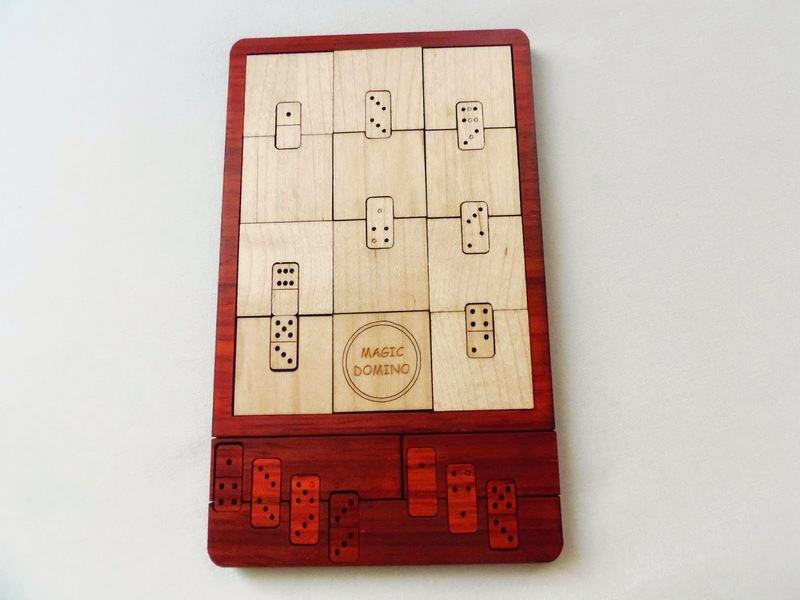 Since there's a difference between the number of white and brown pieces, you need to rearrange all the square pieces inside the tray so they can accommodate the eight dominoes. The puzzle is way more difficult than I thought. It is rated as a level 8/10, and while I expected some challenge I didn't think it was that hard. It took me a few sessions and the total time must be around three hours, more or less. You might not notice this right away from the pictures, but the white pieces are slightly smaller than the brown ones. This is a key to solve the puzzle and I didn't notice it at first. Rearranging the brown pieces at the bottom was relatively easy compared to the challenge at the top. You just need to make a slight change to the rectangular pieces. The 12 square pieces at the top, however, seem much more complicated to swap around. It's only 11 pieces actually, as the piece that reads "Magic Domino" doesn't have any indent cut into it - Could've been even harder, but the slight easiness was more than welcome. Still, finding a correct arrangement was a pain, but the result is very rewarding. Constantin's Magic Domino is the first puzzle of this kind - not a picture, that is - that I know of, so far. It's a brilliant puzzle and I really recommend it to anyone that knows Sam Loyd's puzzles. It provides a great challenge and, of course, it's a must-have in any collection. Availability: You can buy a copy of Magic Domino at PuzzleMaster for $31 CAD. For other Constantin's designs click here. If you're like me and you love multi-level logic games, I bet that sometimes you feel overwhelmed with so many choices the market has to offer. It's a great time to be a fan of these games right now, with their increasing popularity. The reason for this, in my opinion, lies in several factors, like the user-friendly rules, the decent number of challenges available, and of course, the most important one, they're very addictive and fun to play, wherever you are, since they're great travel companions. MetroVille by SmartGames is my latest addiction, from the mind of - who else? - Raf Peeters. With so many designs currently available, I'm yet to find a multi-level game I dislike. This type of games is so fascinating by the fact that there's endless designs possibilities, and whenever I try a different game, I always experience something different. MetroVille is unlike anything I've ever tried. With a dynamic board that's always changing from challenge to challenge, it'll be a while before you find yourself tired of it. The concept, I must confess, was a little harder to understand than other more traditional multi-level games. The challenge cards, for example, is one of the main differences. MetroVille has only eight challenge cards, but actually contains 64 different challenges and four different levels of difficulty. How come? It's simple, since each card features a different city and on each side of the card there's four distinct challenges (two for each difficlty). So, in total, each card has actually eight challenges. Multiply by eight cards, and there you go, 64 challenges. The game board is where the concept really shines. Each of the nine track counters is easily removable and you can rearrange them according to each challenge card. When you pick a card and all nine counters are placed on the board, you can then twist them in 360º into four different positions. By twisting the counters you'll allow the metro to go from station to station, not necessarily all five in one challenge. Each challenge has a specific order for each station the metro should pass. The metro can only go in one direction at a time and can't make sharp turns, like turning left at a crossroads. You can pass through the same path more than once, but once you start you cannot change the disposition of the tracks anymore until you reach the final station. The challenges, like usually, start out quite easy, but as you progress to harder levels it becomes increasingly more challenging. At harder levels it's very hard to find a continuous path that passes through all the stations indicated in the challenge. You'll find yourself twisting the tracks quite a lot in an effort to find the only possible solution for each challenge. I did several of the harder levels and never found the game overly frustrating. Some challenges did took over 10 minutes to solve, but it's never boring and you'll get a great rewarding feeling once you solve one of the "master" levels. MetroVille by SmartGames is yet another great logic game. It promotes logical thinking and strategic planning skills as well as visual and spatial perception. It's great for kids, but also quite useful to keep your adult brain healthy. This kind of games is awesome and I can't stress enough how great they are. Highly recommended, whichever logic game you end up choosing. 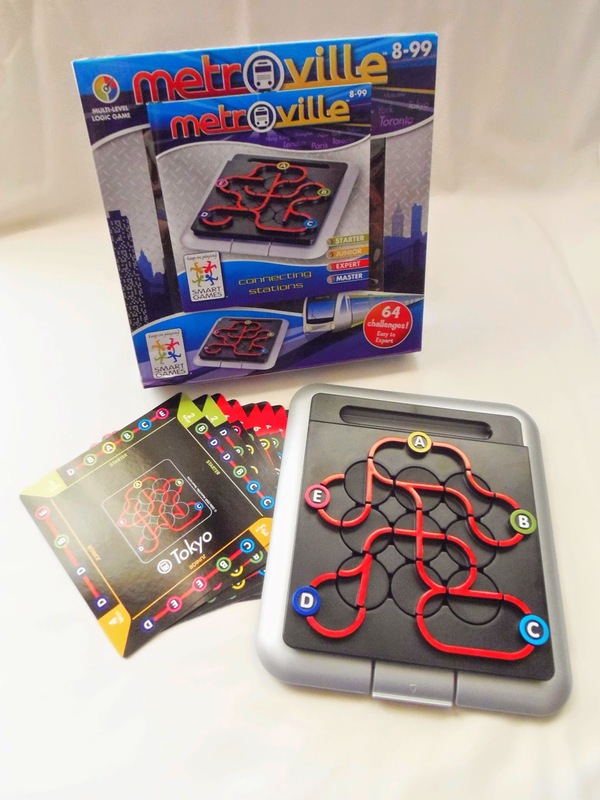 Availability: MetroVille came from PuzzleMaster, but unfortunately it's out of stock at the moment. Check back soon, because they're always updating their stock. In the meantime, check out other great designs by SmartGames. Why do Trick Locks arouse so much curiosity in us? Why are we so attracted to these intriguing objects? Is it because they have the power to lock away secrets? Is it because they offer the possibility to be unlocked by alternate methods other than the traditional turn of a key? Or is it simply because everyone, puzzler or not, are in the same playing field, since it's up to each one's intuition and cunning to unlock its secret. Whatever it is, one thing is certain, Trick Locks are here to stay and challenge our most inner curiosity. 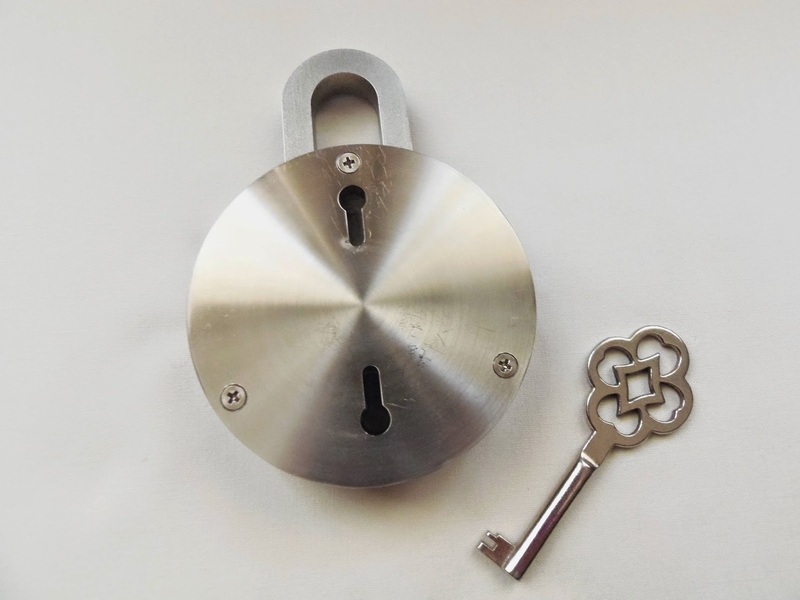 The object that recently attracted my curiosity and demanded to be explored and discovered is Splinter Spierenburgh's Swing Lock, his second contribution to the Trick Lock family. 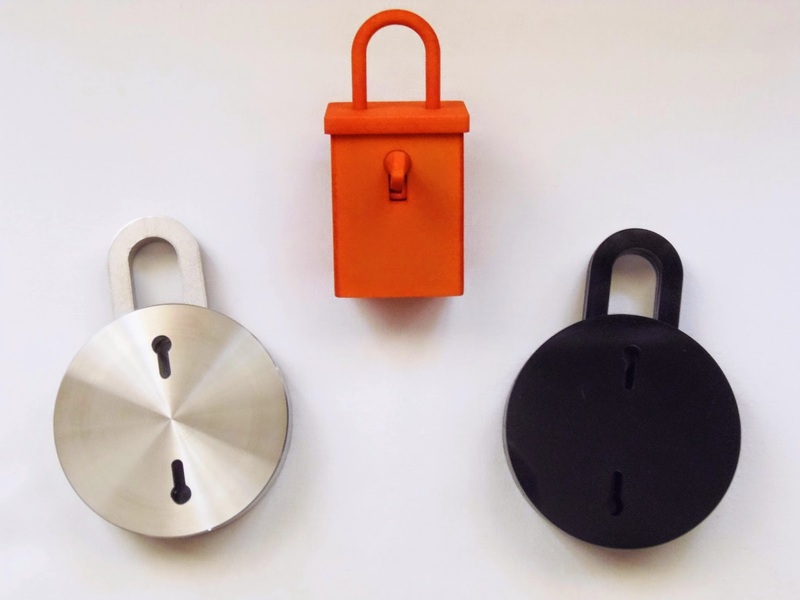 After Splinter's Burgh Lock (seen above), which was made from 3D-printed nylon, a material not entirely recommended for trick locks, the designer wanted to try something different...and what better way to make a Trick Lock than in stainless steel. The result is a near perfect presentation with a stunning and very well polished design, accomplished after some trial and error, also seen by the accompanied .pdf where we can witness the various stages of design and prototyping (from the LEGO concept to the first prototype in fiberboard) that took place before the final stylish version you see here. 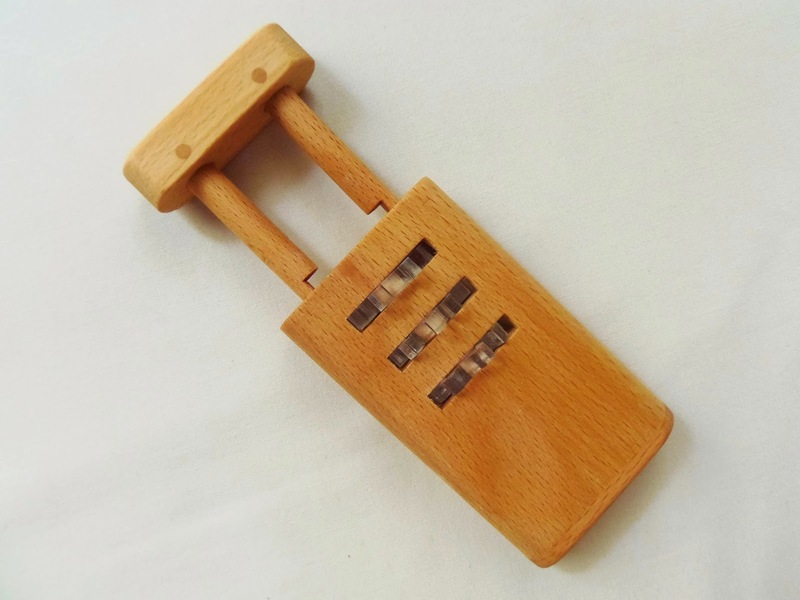 Like many Trick Locks, you are provided with a key - A very stylish key, I might add. How the key belongs in the solution is for you to find out for yourself. Sometimes they're necessary, sometimes they're not. One thing you'll immediately notice though, is that the key interacts with some kind of magnet (or magnets) inside the puzzle. As you push the key inside one of the two keyholes and turn it, you can feel it being attracted to something and interacting with some parts of the mechanism. You'll also be able to hear some parts rattling inside, as if there were parts moving freely around the puzzle. You need to feel the shackle's movements with your hand at all times, to know when or if you've made any real progress. The shackle has three positions: neutral, half down and fully down. When you manage to get it fully down you have solved it, and you just need to pull it up and remove it. When you finally open the puzzle you're not all done, though. You're still half way there. Now, you need to reset the mechanism and be able to close it again. After you've successfully closed it and opened it again in a matter of seconds, thus understanding the mechanism, you can finally say you've solved it. I recommend now to remove those screws and take a look at the mechanism inside - It's a thing of beauty. You'll see the clear window that will let you peer inside, but still protects the mechanism to be accidentally tampered with. 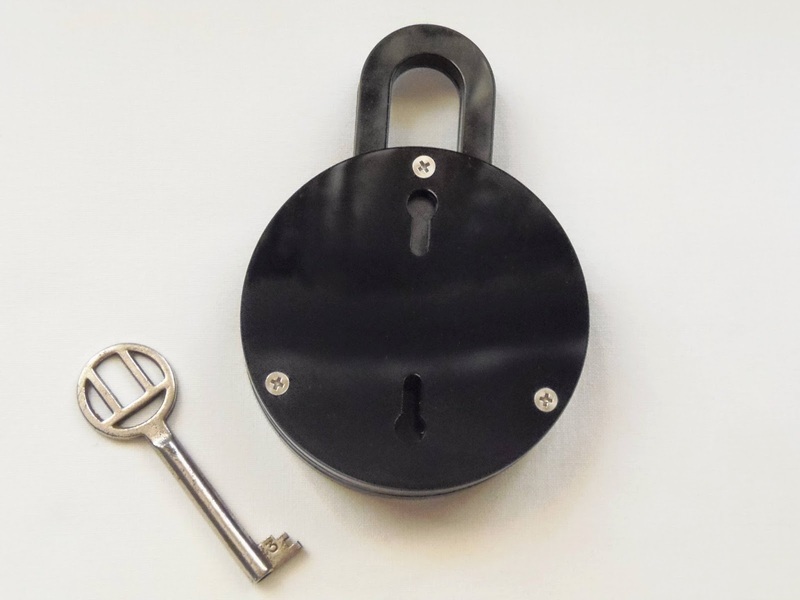 You can also put the lid back at a 33º angle so the keyhole allows you to see just a tiny portion of the mechanism. You can use it as a hint for someone struggling with the solution. 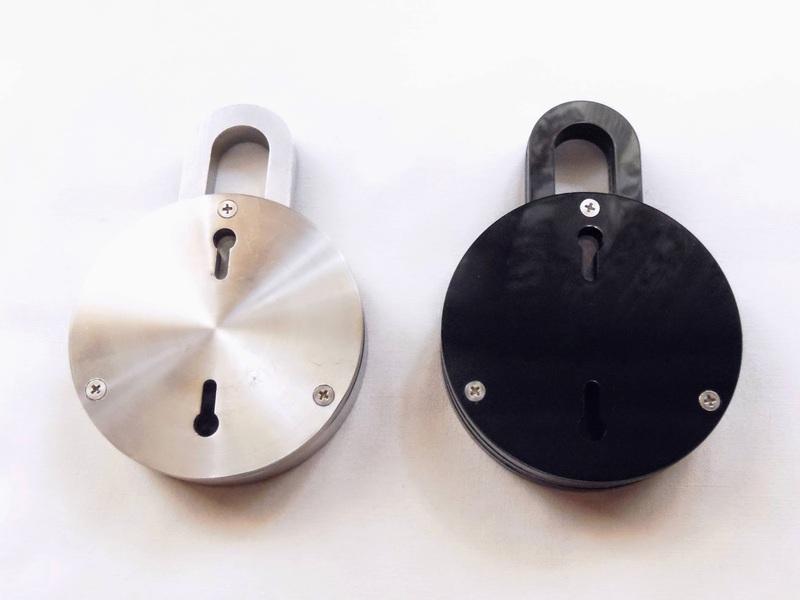 Unlike the Burgh Lock, where the only option was the 3D-printed version, the Swing Lock has two version, the metal one and the plastic one. They're basically the same puzzle, but since the two materials are so distinct there's bound to be some differences. 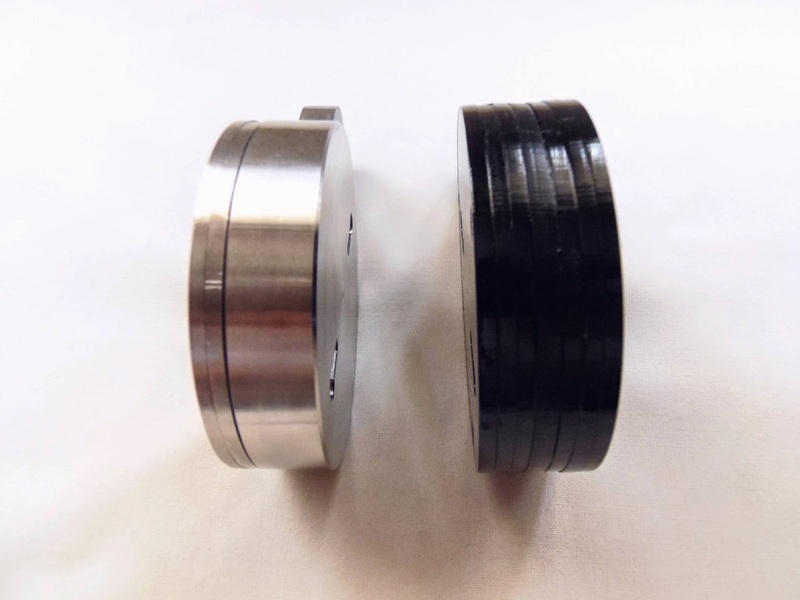 The most obvious differences (not counting the price) are the look, as the plastic (PMMA, perspex) is colored black and, of course, the weight, with the plastic version weighing only 114g (.25lb). The dimensions are about the same for the two versions. As for the solution, there's no major differences from one version to another. I was able to solve the metal version first, in about 20 minutes or so, although it took me much more time to figure out how to close it and ultimately, understand its mechanism. Once I knew what to do I was able to replicate it without any problems in the plastic version. If you ask me what version do I prefer, I'll tell you without a shadow of a doubt, the metal version. But, if you ask me if the plastic version suffers in any way on how the mechanism behaves, I'll tell you absolutely not. It's just a matter of affordability. Difficulty-wise, I found the Swing Lock slightly easier than the Burgh Lock. The metal surely made me more confident to maneuver it without worrying about breaking it - although you still need to worry about not breaking other things if you drop it on the floor. You need three steps to solve it, but to reset it I found that only one move is necessary. There are at least a couple of different ways to close the lock, but none of it involves doing the steps required to solve it in reverse. You have to be creative. Quality-wise, the Swing Lock is two steps forward from the Burgh Lock, no question about it. It looks and feels professionally made, and while I don't have something similar to compare it to, like a Popplock, it's certainly worth its high price. 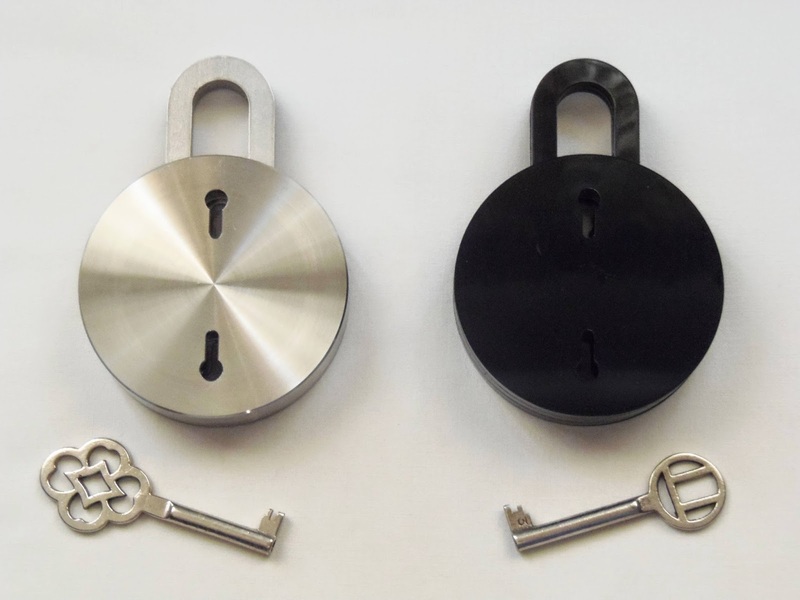 Any Trick Lock collector and enthusiast will love the Swing Lock. I have solved many locks over my years of collecting and I can say that the mechanism is completely unique and original. 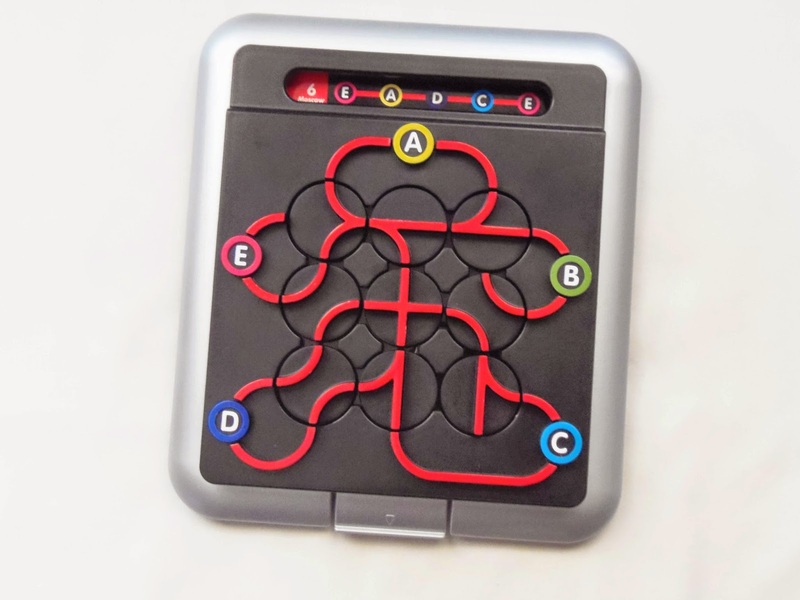 Both puzzles function as they should, there are some good red herrings along the way to keep you from discovering the solution too soon, and whichever version you end up choosing I'll guarantee you you'll have an amazing experience with it. A must have for any puzzle collector. Availability: You can get both metal and plastic versions at MFAVE. If at any time there's a shortage of stock, you can be placed on a waiting list by contacting Splinter directly here. With all the current economic situation in Europe, Siebenstein-Spiele's Euro Krise seems like an appropriate choice to spend some free time. You won't need a doctorate in economy to solve this one, but it might be harder than you think. Can you solve, at least, this small crisis and put some order back in the provided tray? 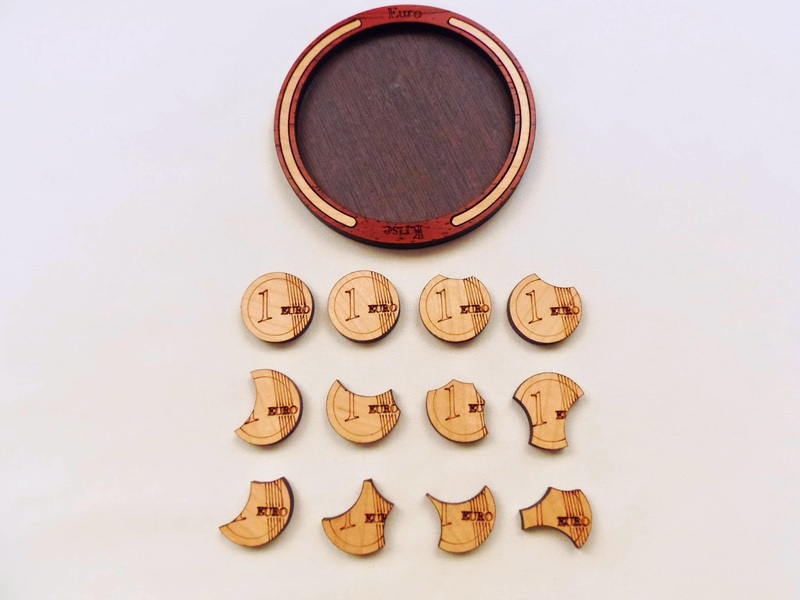 Designed by Siebenstein-Spiele's main designer Jürgen Reiche, and made from laser-cut wood in two colors, the circular tray measures only 10.5cm in diameter (about 4.1"). Inside, it holds 12 coin-shaped pieces cut in different ways. 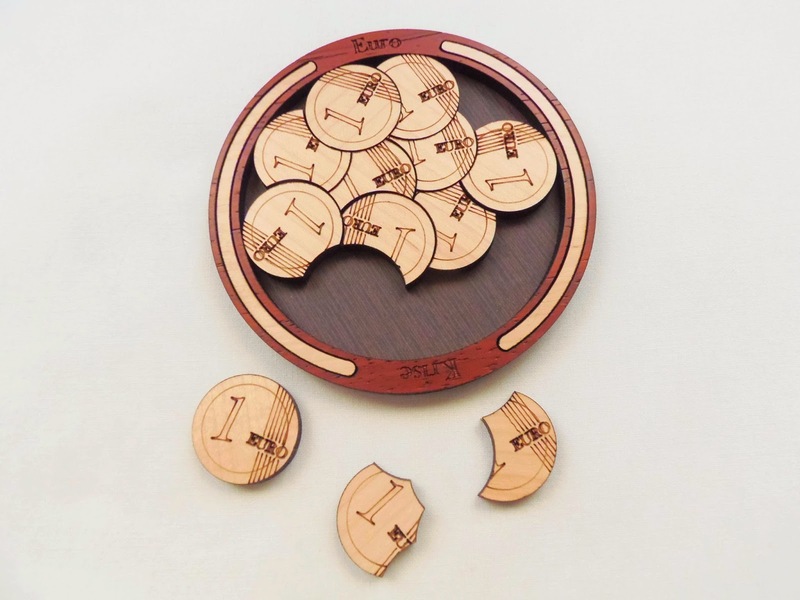 With the exception of two perfectly round coins, the other ten pieces all have distinct shapes that can only be arranged in one unique solution. This makes for one rather challenging puzzle, and since this is a packing puzzle, be prepared for a lot of trial and error. The design of the Euro Krise is fantastic. The cuts in the pieces give the illusion of a 3D effect, as if the pieces overlap each other. 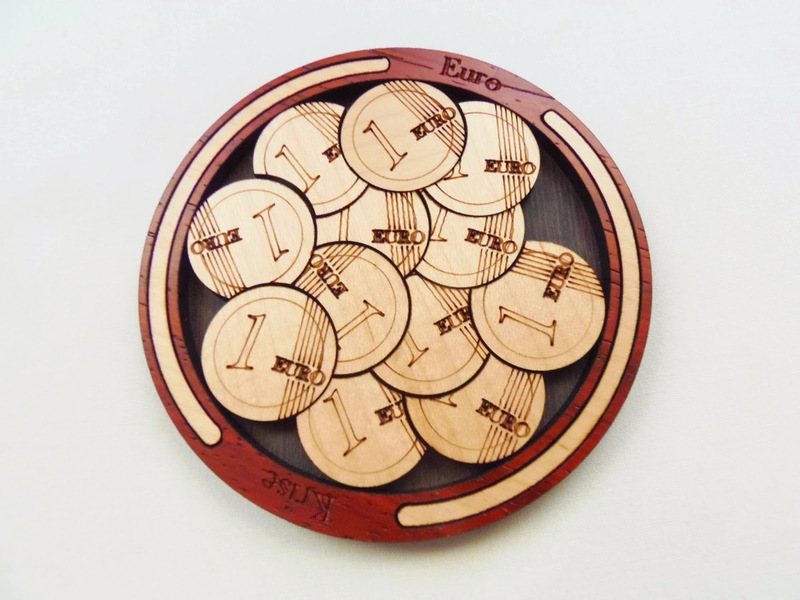 Each coin is engraved to look as close as possible with a real Euro coin, although the diameter is slightly bigger on the wooden version (27mm, as opposed to 23mm on a real coin). The width is also thicker in the wooden version. Rated as a level 8/10, the difficulty of the puzzle is right at the limit of what can be considered a frustrating puzzle. Because the pieces are round, there's a lot of possibilities when you're placing a certain piece. It took me over an hour and a half to finally solve the puzzle, and even then the pieces didn't move as loosely as they did before I took the pieces out. It requires a little adjusting to get the pieces in the right places, at first giving the impression that it's not the real solution you've just found. The pieces are only engraved on one side, so they can't be flipped - It can be a positive thing, since there's less possibilities to place a certain piece. Euro Krise is a cleverly designed puzzle, very challenging, but also quite rewarding when you finally solve it. It's not among the best by Siebenstein-Spiele, but certainly above average for a packing puzzle, especially how well presented it is - Something that this company excels at. Availability: You can find the Euro Krise puzzle at PuzzleMaster for about $19 CAD. For others designs by Siebenstein-Spiele click here. Ring on a Stick is the second puzzle from Dimiter Vakarelov I've had the pleasure to solve so far. 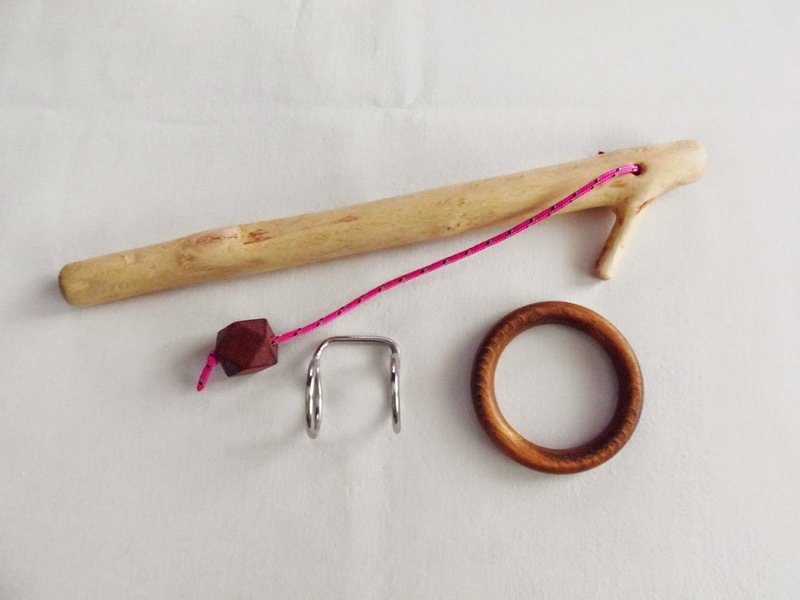 Recently, I've received a very nice package from Dimiter with several unique string puzzles, all designed and handmade by him, and among them there were these three amazing puzzles that were made using real wooden sticks - Something I had never seen before, although Dimiter took inspiration from one of Kirill Grebnev's designs, the Attached Ring. The Ring on a Stick puzzle is a little different from the first puzzle I reviewed from Dimiter, the Cherries on a Stick, but not that different... On the outside, both puzzles look quite different from each other, and besides the stick and the metal rings, there's not much similarities. So how come they are so similar in their solving methods? This is what's so fascinating about this type of puzzles. You have to discover for yourself what principle - or combination of principles - comprise the solving method for each puzzle. See, all these string/wire puzzles you ever saw are based on only 5 or 6 different principles. It's up to designer to find different ways of utilizing these principles and using different combinations to create a new puzzle. 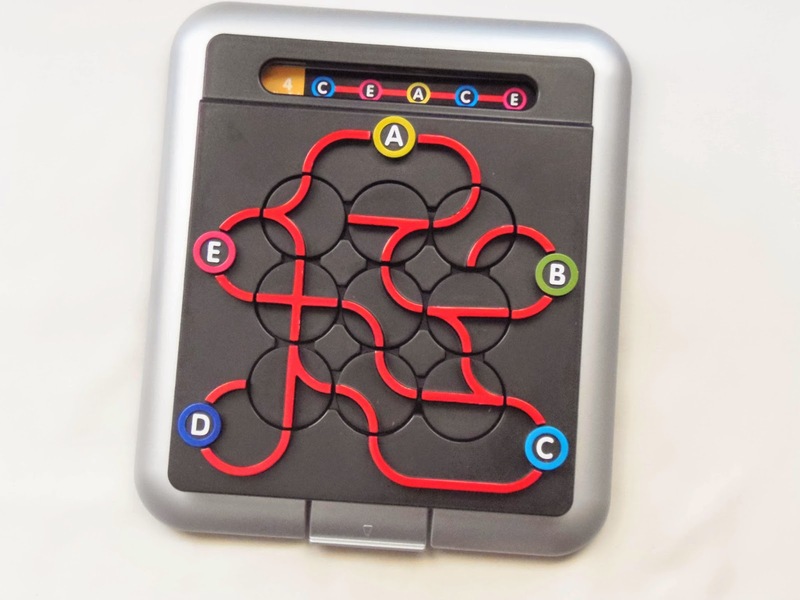 So, for every string/wire puzzle you solve there may be one, two or even more principles represented in the design, and the fun in them is to apply your previous knowledge learned from other puzzles. It sounds easy in theory, but I'm far from understanding all principles, and sometimes it's quite difficult to visualize how to solve a certain puzzle, even if you've solved a hundred different ones before. It all depends if the designer was successful to mask and hide as best as possible the principles used in the puzzle. The Ring on a Stick was a very pleasant surprise in the way that it only took me a couple of minutes to solve after I had solved the Cherries on a Stick - which by the way took me a few hours. This is a bit difficult to explain in words, but to make it simple, both puzzles use the same principle. 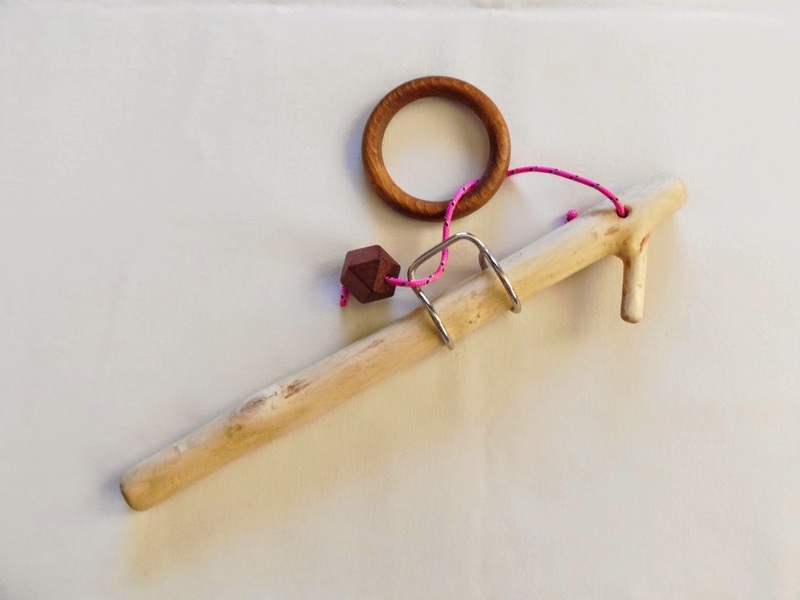 I had the fortune of finding out almost right away that the Ring on a Stick had to be solved in a similar way, in other words, the string had to pass from the inside of the metal ring to the outside. After that, the wooden ring was all but free. In terms of difficulty, the Ring on a Stick is slightly easier than the Cherries on a Stick. Not only because I already knew the solving process, but because I believe it's easier to do the steps required to solve. They're easier to understand. I'd classify it as a level 7/10. As a reference, the Cherries were to me an 8/10. It's hard to choose from the two puzzles which one I prefer. They're both so original and fun to solve, I wouldn't want to choose. For a beginner, the Ring is probably a better choice to start, but it's always a bit relative when it comes to classify string/wire puzzles. Availability: Dimiter can produce any of these puzzles on request. For prices and other questions, drop me an e-mail and I'll put you in contact with him. Another puzzle from the genius of Jean Claude Constantin, 3L is a perfect example of simple becoming complex. Not among his hardest puzzles - not even close - but probably the hardest 3-piece packing puzzle I've ever tried. The design is a bit intriguing, since the tray is shaped like a horseshoe. Not sure what's the significance behind that choice. Also, if you look closely, there's three holes in the right part of the tray and four in the left. I'm probably over-thinking, but it does make you think if there's more to it than meets the eye... The colors chosen for the puzzle, as always, work like a charm giving the puzzle more character and elegance - There's a total of five different wood colors, including the three pieces. The goal of the puzzle couldn't be simpler. You're given three different sized L-shaped pieces and a tray with an irregular area, and the object is to try and pack all the pieces. There's only one way to do it, and the pieces can't go over the edges. The dimensions of the pieces and the tray are just right to make you believe a certain arrangement is possible, but you always end up a millimeter or two short of packing that final piece. Solution: If you're stuck, click here to check out the solution. 3L is a fantastic puzzle. 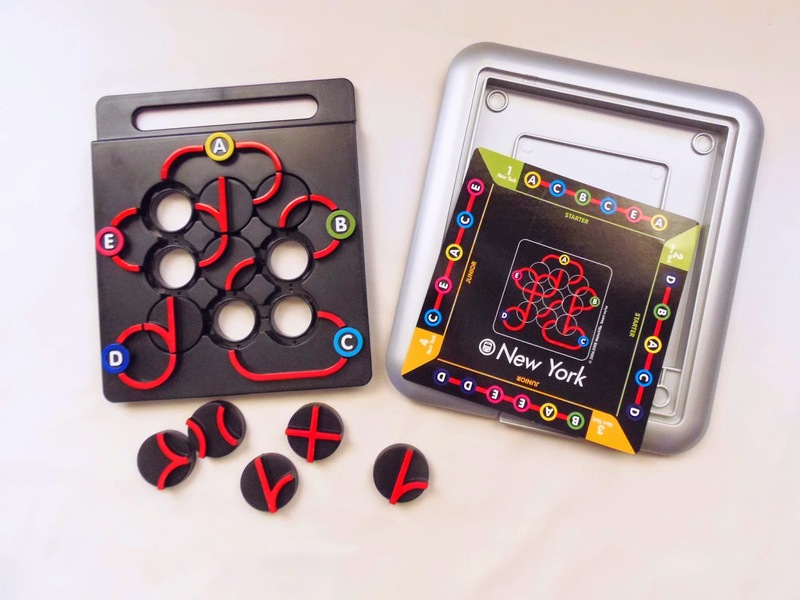 Constantin manages to create a simple and yet challenging puzzle that's perfect for anyone to try, even non-puzzlers. It's a good one for someone that usually doesn't get along with packing puzzles, since it's not frustratingly hard. Availability: Unfortunately, the 3L puzzle is currently unavailable at PuzzleMaster. Check back often to see if it's back in stock, and in the meantime you can browse other great designs by Constantin. 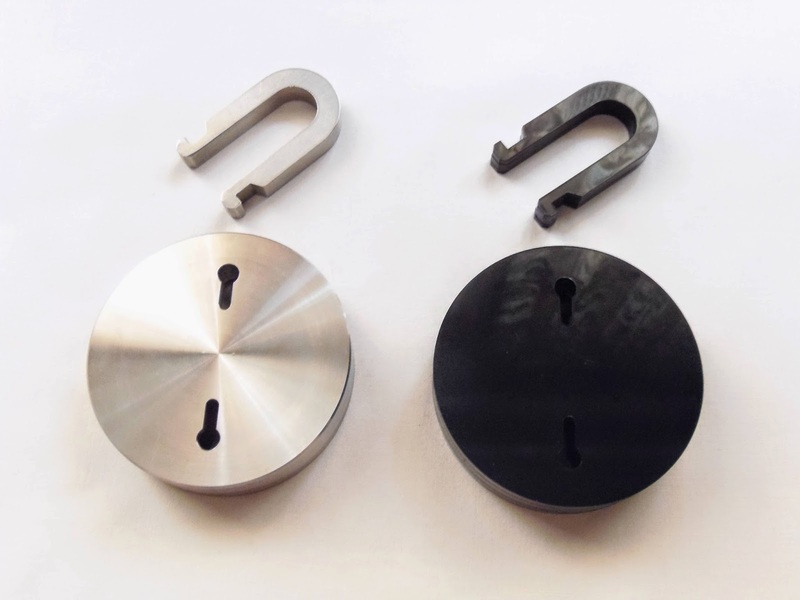 Nowadays, Trick Locks seem to be made from many different materials, as opposed to the traditional metal locks that can be seen everywhere. 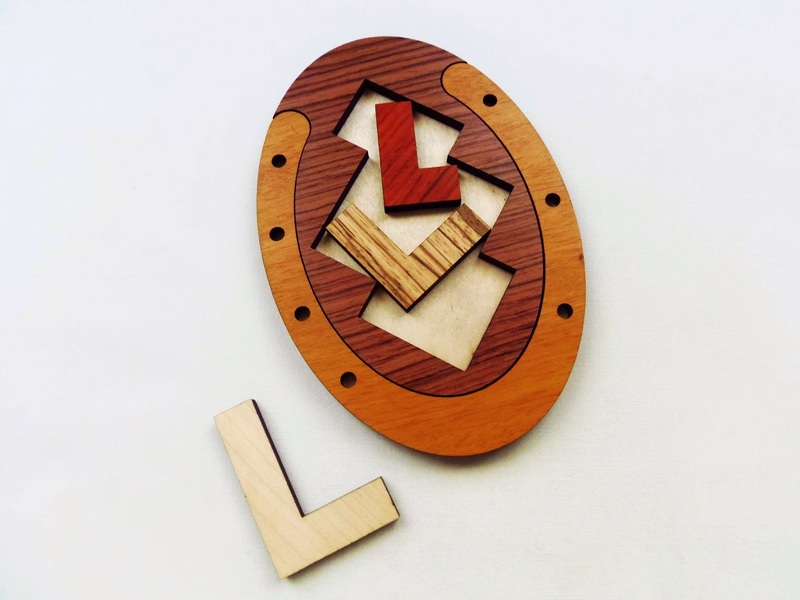 An example of this type of puzzles is the IQ Locker series by Mi-Toys, a collection of four different Trick Locks made from natural wood. 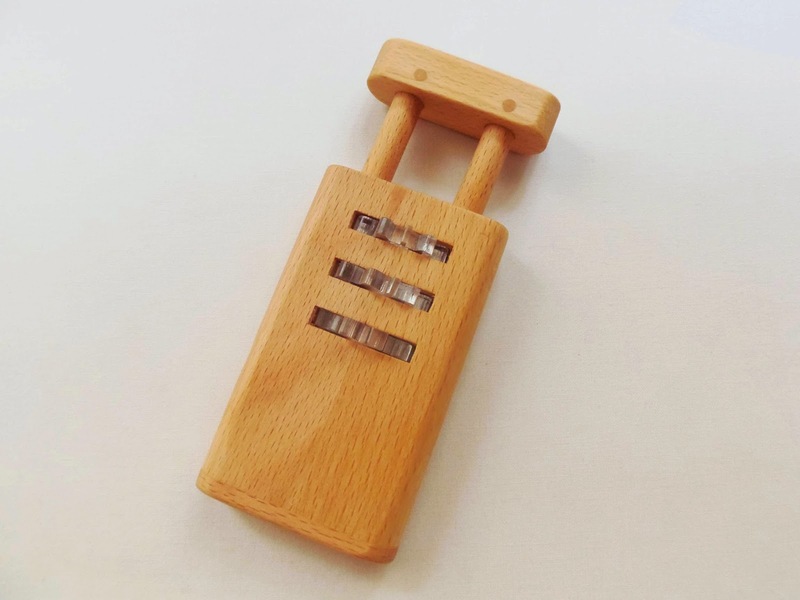 There are some downsides associated with the choice of wood for Trick Locks, but the low production cost seems to weigh more in the end, and the quality is fairly decent to dismiss them, as they're a nice and cheap alternative to their more expensive metal counterparts. The first puzzle from the IQ Locker series I've acquired is the Combination Lock, an intriguing design reminiscent of a number locking mechanism seen in many products, like suitcases. The only difference is that there's no numbers in the Combination Lock, but something more subtle instead... 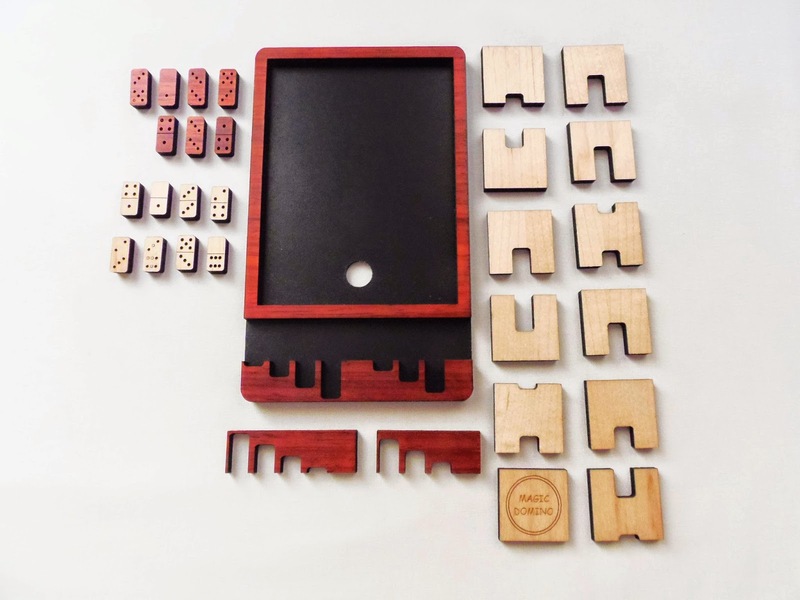 The puzzle seems well built, considering how low the price is, with a polished and clean look. Its dimensions are 14.5cm x 5.9cm x 1.8cm (5.7" x 2.3" x 0.7"), which is pretty nice overall for this kind of puzzle. The mechanism in the Combination Lock is rather interesting, because it has its similarities to another known mechanism, but it still manages to differentiate itself from it with a clever design. The cogs, at first sight, don't seem to have anything special to them - Just three simple acrylic cogs. However, at close inspection, you'll see something surprising. 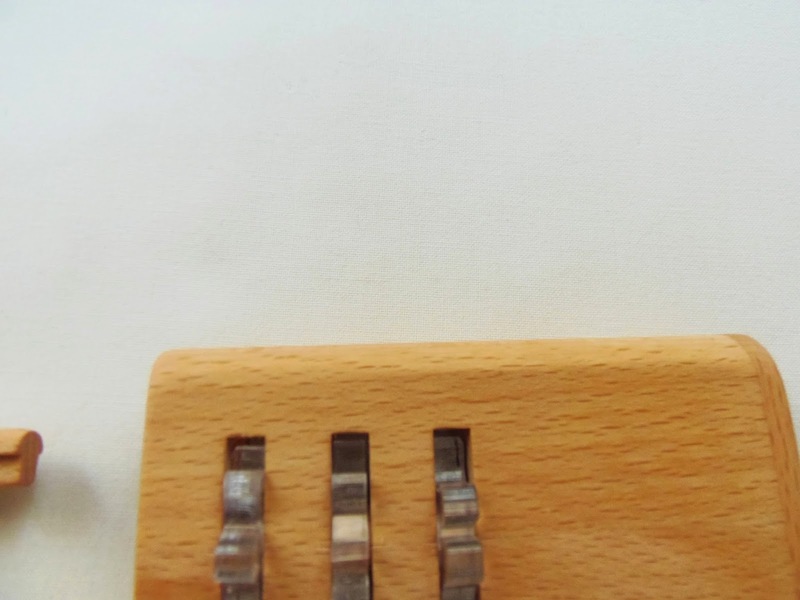 The dents in each of the three cogs have different thicknesses and are spaced in different intervals. Now, I can't say everything about the mechanism, but I'm sure you can have an idea of how they should interact with the internal parts of the shackle. The goal is open and then close the lock. The Combination Lock looks more difficult than it actually is. I also find it strange that it's classified as a level 5/5 - Far from it, actually. It took me less than 5 minutes to open it, but here's the kicker, I didn't know right away it was solved. Why? Because I was under the impression that I had to completely remove the shackle from the puzzle. It turns out that you only need to open the shackle twice as high as its original size over the top edge. It actually took more than 10 minutes to figure it out, so I guess you could say I took around 15 minutes to solve it. It all comes down to interpretation of the instructions, which only mentions "Open it" and "Unlock it". There are cases where you can completely remove the shackle from the puzzle (including one I've recently solved), so that's what my initial confusion was all about. The puzzle has two different stages until it's fully opened, so you need to rotate the cogs one a time to pull the shackle all the way up. Closing the lock is much easier, since you can see how the cogs will interact with the shackle. Difficulty-wise, I'd say it's more like a 3.5/5. The Combination Lock was a nice surprise, considering my expectations weren't as high as for a metal lock. Yes, you have better feedback from a metal mechanism, but in this case I believe you don't lose too much with the wooden/acrylic mechanism. 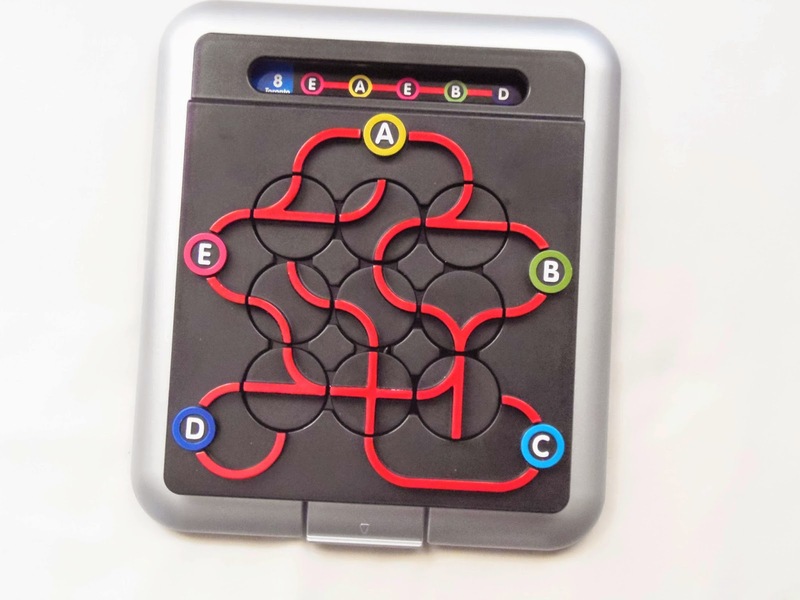 Pretty good puzzle, overall, and recommended for Trick Lock enthusiasts. 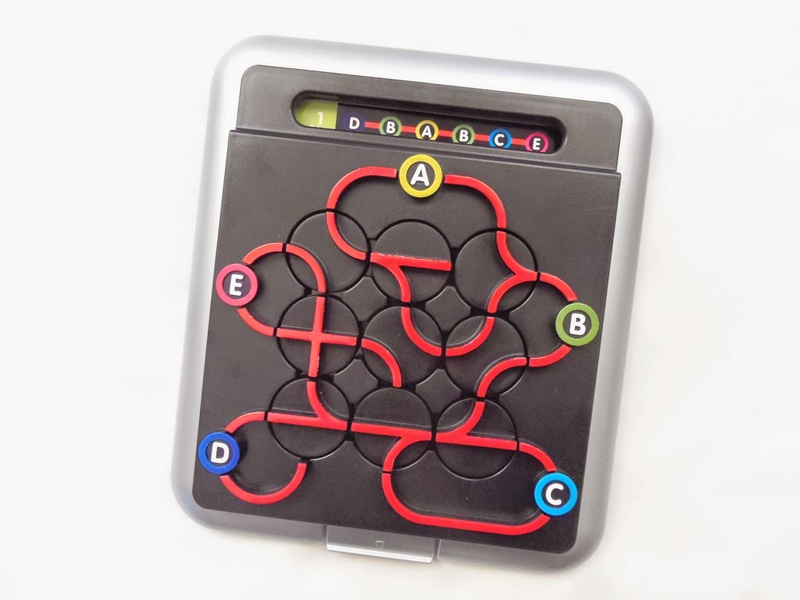 Availability: The Combination Lock, as well as the others in the IQ Locker series, can be found at Brilliant Puzzles for just $10.95 USD each.